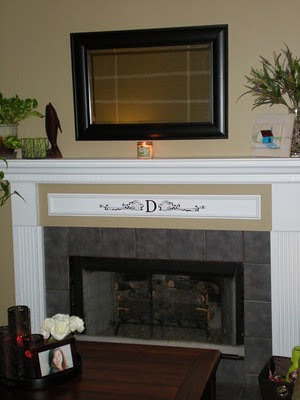 The mantel of a fireplace is definitely (definitely) the main focal point of the room and acts as a visual achor to bring all the elements of a room together. Details like architectural molding, crisp colors or warm wood tones, and a little something extra all contribute to make that visual anchor a fabulous detail of the room. Check out this custom vinyl wall art piece we did recently. Even though it's small (about 2" tall x 36" wide), it stands out beautifully on that bright white molding around the fireplace and is an exceptional detail for this room's beautiful focal point.